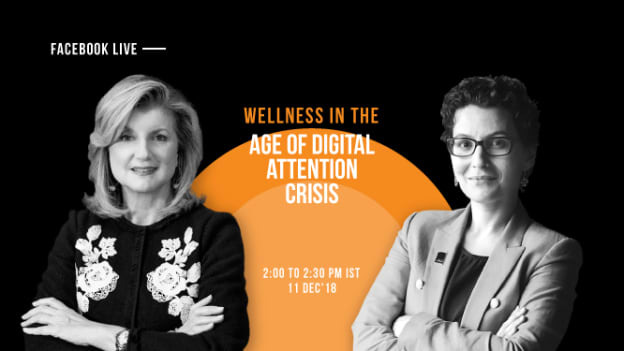 In a Facebook live session, Arianna Huffington, Founder, Huffington Post, Founder & CEO, Thrive Global and Ester Martinez, CEO & Editor-In-Chief, People Matters Media will talk about ensuring well-being in the digital age. The world seems smaller, knowledge is easily accessible, so is entertainment and businesses can cater to a global market very easily by sitting in one corner of the world. The smartphone era has surely brought regions and people closer but the benefits of technology and the related acceleration in the pace of development has come at a cost. Work, relationships, leisure and education everything has moved to the smartphone. People are always busy, eyes wide open staring at their screen. Anywhere, anytime any information can reach them and they can access every information, leaving them no time to relax and giving them no peace of mind. While we have quickly become accustomed to having the world's information tucked neatly into our pockets, we fail to realize that our brains are not designed to be constantly consuming and processing a never-ending stream of information. The brain needs a break. To discuss the impact the digital age has had on the wellness of employees across businesses and regions and to talk about the ways in which wellness can be ensured, Arianna Huffington, Founder, Huffington Post and Ester Martinez, CEO & Editor-In-Chief, People Matters Media will address the challenge of maintaining wellness in the age of digital crisis. They will also speak about the role leadership plays in sponsoring a culture of wellness and share how companies can go beyond physical wellness. With her venture, Thrive Global, Arianna aims to end the stress and burnout epidemic by offering companies and individuals sustainable, science-based solutions to enhance well-being. She wishes to help people create a healthier relationship with technology and hence, comes together with People Matters to share her knowledge and experience with the world of business. The interaction will be streamed live on Facebook at 2:00 PM on 11th December 2018, Tuesday. Block your calendar and don't miss the opportunity to learn how to recalibrate your relationship with technology. Click here to register. NEXT STORY: What is slowly killing the Indian organizations from inside?